J.S. Bach's monumental The Art of the Fugue in a unique version as a reed trio. The score is not modified in any way; all voices appear in the registers as intended by the composer. Trio 335 was formed in 1999 to perform and record J.S. Bach's monumental The Art of the Fugue in a unique version as a reed trio. 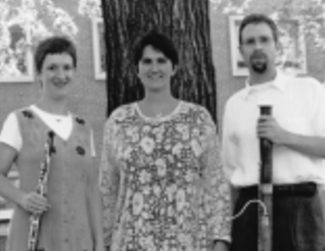 Amy Goeser is Principal Oboist of the Wichita Symphony Orchestra, Assistant Professor of oboe at Wichita State University, and oboist of the Lieurance Woodwind Quintet. Accordionist Heike Storm studied at the Folkwang College in Essen, Germany with Japanese accordion soloist Mie Miki. She was a prize winner in Germany's Jugend Musiziert competition from 1981-1983. Currently a resident of Munich, she is employed as a teacher and clinician for young children and is a regular guest and soloist at seminars of new music throughout Germany, the United States and most recently Argentina. Bassoonist Steve Vacchi studied at the Eastman School, Yale University, the Hartt School and Louisiana State University. Currently Associate Professor of bassoon/theory at the University of Oregon School of Music and a member of the summer artist faculty at North Carolina's Brevard Music Center, Dr. Vacchi was formerly on the faculty at Wichita State University.